I bumped into Tom Hargis at the climbing gym where I work out Tuesday night - he was in town to do a slide presentation at the annual Boealps banquet that Friday. The weather had been great, and was forecast to continue that way, so I asked him if he might have time to do a climb with me in the next couple of days. The only day that he had available was the next day, Wednesday, so we decided to take advantage of that and plan a day climb somewhere. 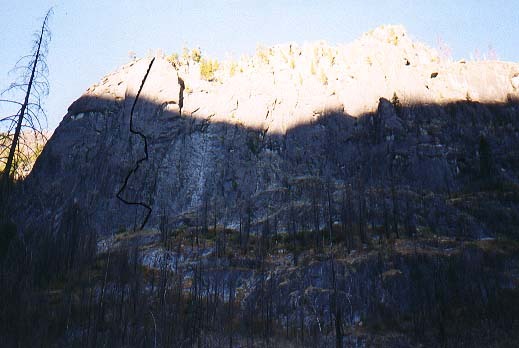 I'd been climbing a bunch during the summer, once a week in the gym, a couple of trips to Skaha, and many evenings spent out at Exit 38. I wanted to push myself on a classic climb, and I wanted to do something without bolts, so I suggested heading to Snow Creek wall to climb Outer Space, the Washington 5.9 classic. Tom had climbed this many, many times before, but was happy to agree - the day looked like it would be wonderful, the climbing was excellent, and it would be a fun day. I picked Tom up in Issaquah early the next morning, and we started the two hour drive to Leavenworth. We arrived at the Snow Creek parking lot by about 8:00, and then hiked quickly up to the base of the wall, which we reached around 10:00 . Tom was leading this outing (and lead every pitch), and decided we'd start with the first three pitches of "Remorse", meeting up with "Outer Space" on Three Tree ledge. The first pitch wandered up and over some blocky terrain, hardly even worthy of a 5th class designation. 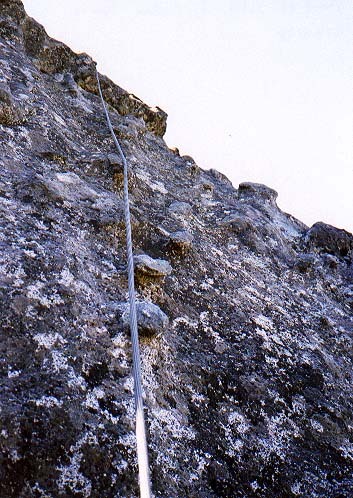 The second pitch was more interesting, with an overhanging fingertip traverse that ends at a spot where a large, confident step must be made to easier ground. From the second belay, it was a short pitch up a nice crack system (or it could be done as a slab or as an arete - it'd be fun to come back and try all the variations) to Three Tree ledge. Tom warned me that the first few moves off of the ledge were the first 5.9 section, but that was followed soon after by the infamous 5.9 traverse. I watched him as closely as possible to pick up some pointers as he disappeared up the rock face, but by the time he was at the traverse, it was tough to see just what he was doing. It took him a significant amount of time to protect and complete the traverse - this gave me a clue that it'd probably be a challenge for me. The first little bit off the ledge was a piece of cake, and the short scramble up to the start of the traverse didn't give me any difficulties either. The traverse, however, was another matter. I started out on the traverse 4, maybe 5, times, each time backing off as I got to a spot that seemed blank to me - at least I couldn't figure out a 5.9 way of doing it. I kept feeling down low for something for my feet, and was entirely unsuccessful. Eventually, I bridged way across the traverse with my feet, finding a small nubbin on the right side to stem against. I then ungracefully lunged for the flake on the other side of the traverse, and successfully "discovered" a 5.10b method of completing the 5.9 traverse. I'm certainly not ready to lead that pitch yet, but I'd love to go back and try it again, maybe with two rope teams, so someone who has done the pitch before could coach me through it. The climbing eased significantly from there. I raced up to the top of a flake, then down the other side to Tom's belay. He headed up the crack and chicken head sea above us, and when my turn came, I realized the real fun had begun! Huge knobs everywhere, a wonderful crack system running right up the center to plug with pro, and a wonderful sense of exposure! The views were nice, but being in a canyon, they didn't really open up until we were to the top, but the real fun of this route is the climbing! Before I was ready, we were pulling ourselves up onto the plateau on top, and the climb was done. We rested for a bit, and finished off our water before starting the descent. The way down was definitely trickier than the way up, downclimbing scree littered, downsloping ledges, and clambering down some 3rd class sections. We eventually turned the corner back towards the base of the wall, and we paused to watch some folks working on Orbit, and on another line we weren't sure of. Back at the packs we wolfed down a quick lunch, then hurried back to the parking lot. Tom had a dinner date in Issaquah, and we needed to be back by 6:00. We hit the sun baked truck around 3:45, gave it a few minutes to cool off with the windows open, then hit the road back to the west side, arriving at the restaurant he was meeting his friends at just a few minutes early.